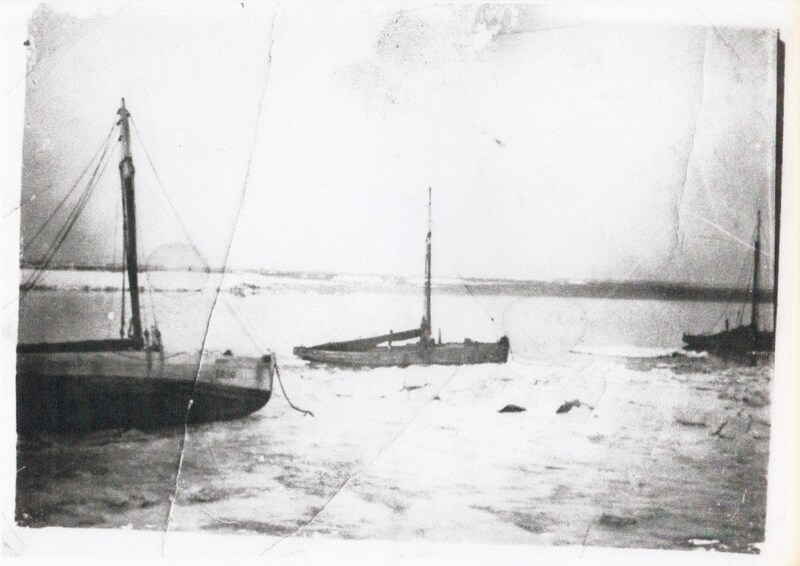 “Maud Raby”, LR 60, “Linda” LR 24 and “Fanny” in the ice, December, 1940. “Maud Raby” registered at Lancaster as LR 60 was the last boart to be built by Crossfields of Arnside in 1932. She is rigged as a smack with a mainsail, foresail and Jib. She was owned by Walter Raby of Morecambe. “Linda” was built by Crossfields of Arnside in 1920, being 32 ft overall with a beam of 10ft., weighing 3.17 tons. She had an auxilliary motor and was rigged with a mainsail, top and jib sails, later owned by Amos Willacy (24.1.38). She was registered at Lancaster as LR 24. “Fanny” registered at Lancaster as LR 4 on inside moorings for a spring paint up. “Fanny ” was built by Crossfields of Arnside, 1912 for David Willacy, being 28 feet overall with a beam of 9 feet 6 inches, weighing 6.56 tons. She had a motor and was rigged with a mainsail, foresail, jib and a gaff topsail with a crew of two. Later owned by Reuben Willacy and then Gilbert Willacy. .